Mr. Keaton always preferred the chase to the pie. 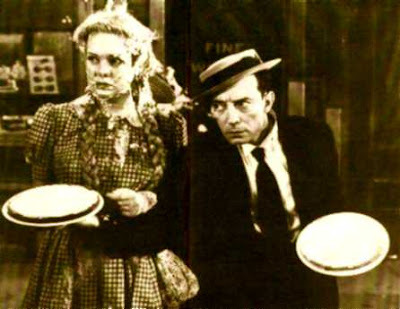 Over at To Be Cont'd, I continue our month long conversation on the summer blockbuster by examining the relationship to the Cinema of Attractions and Donald Crafton's idea of the "pie and the chase," and how we're moving toward a pie-centric blockbuster. I also expand on the ideological elements of blockbuster cinema, and explain how a great metaphor like Jaws works while Star Trek Into Darkness makes me want to destroy the very idea of a political cinema. Read that here. The Strange Little Cat played at the Toronto Film Festival, and it's an absolute delight as I argue here. It's Bergman Vs. Bergman over at The Film Stage, where I review Criterion's recent Blu-Ray update of Autumn Sonata, directed by Ingmar Bergman and starring Ingrid Bergman. I also review the new late-term abortion documentary, After Tiller. On Letterboxd, those who've seen Blue is the Warmest Color, the Palm D'Or winner from Abdellatif Kechiche, can read my spoiler-filled take on the very good, often misconstrued film. I also have shorter pieces on Fritz Lang's M, Howard Hawks's Fig Leaves, Renoir's The River, Claire Denis's Trouble Every Day, Don Siegel's Coogan's Bluff. I also went kind of long and super ambivalent on Hour of the Furnaces, if you're curious about that one. Finally, Jordan Cronk came on The Cinephiliacs, where we reviewed Repo Man.